Furniture: Reupholster, Deep Clean, Slipcover, or Donate? Weather you have found a beautiful antique piece at an estate sale, or just have an older piece of furniture in your home that needs some updating here are a few tips to help you decide when its time to invest or when its best to trash it. To determine the costs below we sent one of our very own to determine the cost for her couch and ottoman. *Prices reflect current costs in the greater western suburbs of Chicago, IL. Lets face it, reupholstering any of your furniture is expensive! An ottoman will usually cost about $300-$500 for labor alone. A couch will range from $1,500 – $3,000 for labor. Add the cost of fabric on top of that and you are easily spending far more than you would on a brand-new store bought piece of furniture. So what motivates people to reupholster? Older furniture tends to have more quality than modern furniture. Today cheap woods, fixtures and fabrics are the norm. Finding antique furniture most likely ensures that the bones of the piece is created with integrity and quality. Many people will invest in revamping an older piece because they know it will last them longer than any furniture they invest in new from the store. 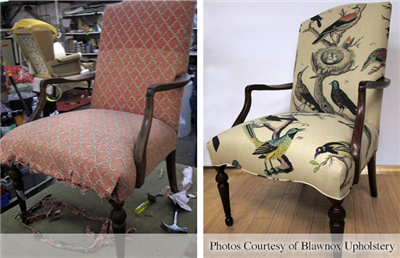 Another reason people choose to reupholster is because there is sentiment tied to the furniture. When there is emotion involved it is often a great choice to reupholster the piece of furniture to ensure it has the beauty to last generation after generation. A final reason is because lets face it, you can create some really customized, unique looking furniture with a new skin of fabric. High end designers often will leverage reupholstering even on new pieces of furniture to ensure their client is getting the absolute best piece for their home. If you are fortunate enough that your furniture has a beautiful, timeless fabric, then a deep cleaning can be a very affordable option. The same ottoman referenced above would cost about $75 for a full detail and deep cleaning while the couch would be about $250. Hiring a professional is important for this cleaning as often when DIY’ers try to do this on their own they leave behind moisture that can damage or stain the furniture permanently. Reasons not to deep clean include furniture that has pre-existing damage to the fabric. Deep cleaning could cause further damage to the furniture. Another reason not to deep clean would be when the fabric you have is dated or if the cushioning is damaged beyond repair. Slip covers can have a wide price range depending on if you use the traditional store-bought option or opt for custom-fitted covers. Traditional slip covers that can be bought at any home store have come a long way over the past few years. New fabrics have a more elastic feel and can fit furniture more easily. This means users are less likely to experience the bunching that was seen in older slip cover materials. Slip covers for an ottoman start at about $45 and for a couch can be as low at $20! Custom slip covers are a very popular trend right now. They allow you to make a change to your furniture more affordably than reupholstering. It also enables you to pick trendier fabrics since you can remove the slip cover and have a new one made every few years. Custom slip covers may still have small areas of bunching, but far surpass the look of traditional slip covers. An ottoman starts at about $100 and a couch at about $300. There are so many families in need! As a last resort, if you feel the options above are not the right fit, donating your furniture is a wonderful option. There are many charities that will come to your home and move the furniture for you. Othercharities may have the need for furniture, but do not have the ability to move the pieces. Check local charities and consider gifting your unwanted pieces to a family in need.